Menno and Janneke van Mechelen are not the typical backpackers you would expect. To start off with, we are in our late 40’s. We are just an average South African couple. Myself, Menno and Janneke, my wife, have spent way too much time being responsible and trying to build up the resources that we hope will one day be sufficient to carry us through our retirement years. In the meantime, we have neglected seeing the world and having a decent holiday. We have always been guilty of putting this off for the future. In fact, I, Menno, have only been overseas once to visit my brother in Auckland, and Janneke had never been overseas at all. This all changed when we embarked on our first backpacking trip to Thailand. When one embarks on traveling to a strange country, with a different culture & language, obviously there are many fears to overcome. This is what makes it a challenge & worth doing. It would be soo much easier just to book a travel package, but we have no interest in traveling like that. It would take away half the fun and memories we can make, but slogging it out on our own. Unlike many young backpackers, who have traveled the world, we are new to this, but unlike the saying about “old dogs & new tricks”, we still think we can learn a lot from simply going ahead & booking a flight to Thailand, making sure we know where we are sleeping on the 1st night & then taking it all in our stride from there onwards. So, it is quite obvious to see that Menno and Janneke are not your typical, travel smart globetrotters. So, let’s see how we do with this, our first of many such excursions. This trip is beyond our comfort zone and beyond the shores of our beautiful country. We look forward to exploring another beautiful country, in this case Thailand. Follow us, join us, comment and enjoy with us. 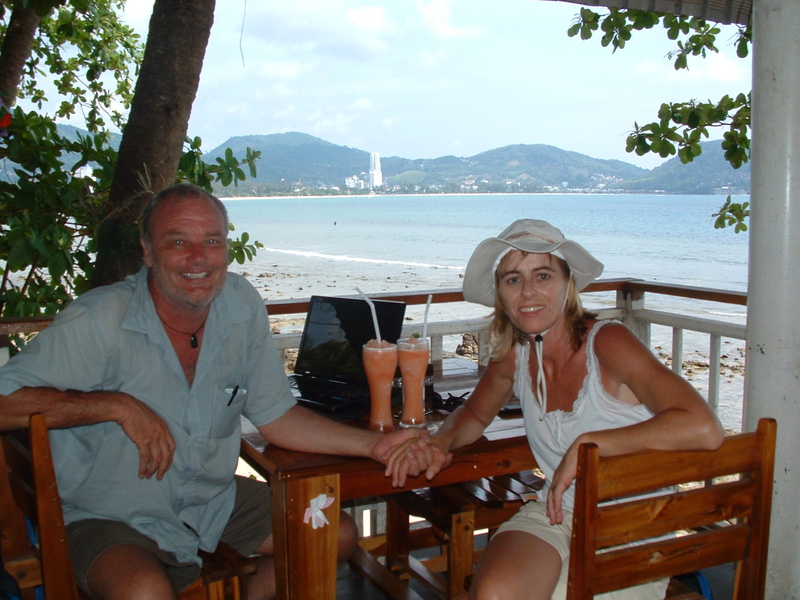 See how we cope as 47 & 48 year young, “Midlifebackpackers. Hey guys, I love your photo of Menno sitting on a sunbed and typing on his laptop. I’d love to use it in my post, of course I’ll give you the credit! Would you mind that?